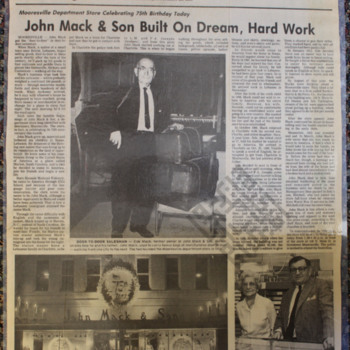 "Photographs of the Mack Arabic family Bible, including detail images of the front and back pages and inscriptions and photographs of the ephemera kept in the Bible at the time of the interviewer's visit to the Mack family. This video was donated by the Mack family. It was first created in 2007 and updated in 2009. It contains a history and pictorial family tree of the Mack family, and was created for use at family reunions and celebrations. Photographs of the Mack English family Bible, dating from 1927. In addition to detail photographs of the Bible, this set contains images of ephemera found within the Bible at the time of Mitchell Mack's interview. A photograph of an unidentified woman from the Mack family seated in front of a house. A photograph of the extended Mack family, photographed in formal wear. Though the subjects are unidentified and the photograph is undated, it was likely taken in the late 1980s-early 1990s. A photograph of a wedding dress and shoes, on display in a glass case.